Social Class in old England was a very rigidly and carefully defined hierarchy. Everyone was quite conscious of the social class to which they belonged and many were constantly trying to elevate their social ranking. The true ruling classes of England in those days were the Aristocracy (Nobilitas Major) and the Gentry (Nobilitas Minor), all families of which had been granted Coats of Arms. To assure proper control and documentation of these grants of arms, a college of heralds arose, who worked on behalf of the sovereign and were given full authority to settle disputes, legalize grants of arms and make new grants. Today, that function is performed in England and Wales by the College of Arms, located in London. Before the Industrial Revolution and the egalitarian trends of the nineteenth and twentieth centuries had taken effect, most political power and social privilege belonged to these classes alone. If you were not at least a member of the Gentry, you were not even entitled to use the terms of Mr., Mrs. or Miss in connection with your name! You were just plain old Thomas Norfleet or Elizabeth Pheasant, although you might respectfully and affectionately be referred to as "Goodman" Norfleet or "Goodwife" ("Goodie") Pheasant. A few years after the time of the emigration of the first Norfleets to Virginia Colony, in the seventeenth century, a herald (Rouge Dragon Pursuivant-at-Arms) named Gregory King worked out a distribution by social class, including both numbers of people and family income, of the English population for the year 1688. The accuracy of this distribution has been challenged by several modern historians and sociologists. However, Kings distribution remains the best and most detailed survey of English social class before the enormous changes brought about by the Industrial Revolution. The Norfleets apparently were members of neither the Aristocracy nor the Gentry. 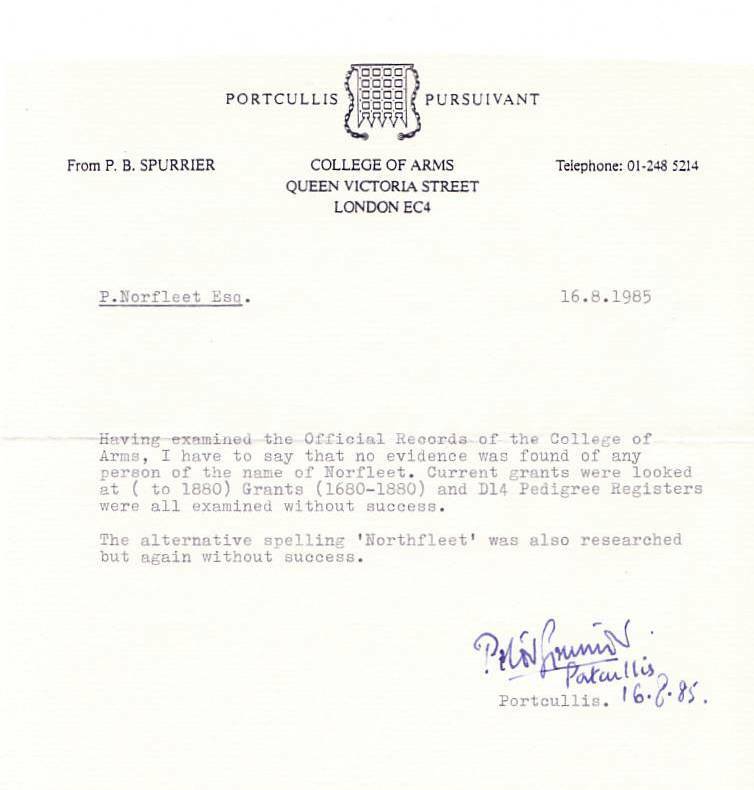 In 1985, I had the College of Arms in London conduct a search to see if a Coat of Arms had ever been granted to a Norfleet; negative results were obtained (see copy of the letter at the right). Based on information contained in parish registers, marriage licenses and wills, most of the English Norfleets were apparently of the middle class being typically farmers or tradesmen; the more successful people were designated as "yeomen" or "householders." Before parish registers were required in 1538, virtually the only people ever mentioned in the written records were members of the Aristocracy, the Gentry or the Clergy. Accordingly, all the events involving the Norfleets recorded during the period prior to 1538 are associated with people who were members of the Clergy or who were involved in legal proceedings. Prior to the Court of Probate Act in 1857, virtually all English wills were proven in ecclesiastical courts. One exception was the secular Court of Husting in London, which is the oldest court of record in London and was the court of probate with respect to goods and property lying within the City of London in the later Middle Ages. However, for most wills made subsequent to 1500, the Archdeaconry Courts exercised the probate responsibility. Even so, the Prerogative Court of Canterbury (PCC) was considered to be the foremost court of probate in England and Wales and was frequently utilized by the higher social classes. It, also, was the only court, which could prove wills made by persons dying in the colonies or at sea who left estates in England. For this reason, the wills probated by the PCC are the ones most often searched by Americans looking for colonial ancestors who died leaving estates in England. 1. Prerogative Court of Canterbury: The will, dated 18 February 1662/1663, of John Norfleete, Mariner of Faversham Parish, Kent was proved in the Prerogative Court of Canterbury in 1662/1663. His will provides for his "dear Mother" - 10 Pounds; to his daughter Susan (an infant) - 100 Pounds, when she reaches 21 years of age; to his brother Thomas - 5 Shillings; and the remainder of his goods to his wife Margaret; his wife is also named as sole executor. Since this will was proven in the Prerogative Court of Canterbury and there is no record of burial in Faversham, it is probable that this John Norfleet died overseas (perhaps in Virginia Colony?). The sum of 100 Pounds was a substantial amount in 1663, more than two (2) years income for most people in those days (see Gregory King's distribution in Section 3 of this essay). The original will is on file at the Public Records Office, London. This John Norfleet is probably the same person as the John Norfleet listed in the Faversham militia muster roll, dated 30 October 1661, as a pikeman of the "Trained Company" (see Section 8 of this essay). 2. Archdeaconry Court of Canterbury: The will, dated 08 January 1680/1681, of Thomas Norfleete, Yeoman (Householder) of Molash Parish, Kent, was proved in 1681 in the Archdeaconry Court of Canterbury. 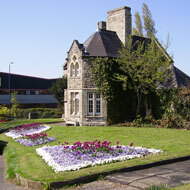 His will provides for the following: To his daughter Francis Lowd - 100 Pounds; to his daughter Susan Norfleete - 100 Pounds; to his son John Norfleete - 5 Shillings; to Katherine, the wife of John Norfleete - 4 Shillings; to his sister Tabitha Adams for her natural life a dwelling where his "deceased Mother" had previously lived; to his son Thomas Norfleete all of his lands and tenements lying in the Parishes of Molash and Smarden. As mentioned above, the amount of 100 Pounds was a very significant sum in those days. The original version of this will is on file at the Kent County Archives Office, Maidstone, Kent.3. Archdeaconry Court of Canterbury: The will, dated 08 January 1680/1681, of Thomas Norfleete, Yeoman (Householder) of Molash Parish, Kent, was proved in 1681 in the Archdeaconry Court of Canterbury. His will provides for the following: To his daughter Francis Lowd - 100 Pounds; to his daughter Susan Norfleete - 100 Pounds; to his son John Norfleete - 5 Shillings; to Katherine, the wife of John Norfleete - 4 Shillings; to his sister Tabitha Adams for her natural life a dwelling where his "deceased Mother" had previously lived; to his son Thomas Norfleete all of his lands and tenements lying in the Parishes of Molash and Smarden. As mentioned above, the amount of 100 Pounds was a very significant sum in those days. The original version of this will is on file at the Kent County Archives Office, Maidstone, Kent. By the late Sixteenth Century, marriage by license rather than by the traditional publishing of parish marriage banns was becoming increasingly popular, particularly among the more "well to do" people. Use of licenses avoided the publicity of the banns procedure and required less time before the actual marriage ceremony was carried out. 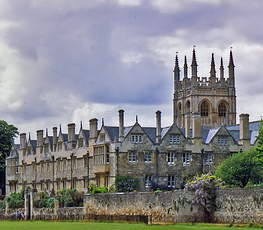 The Faculty Office of the Archbishop of Canterbury could authorize a marriage in any parish in England. Also, the Vicar-General of the Archbishop of Canterbury could issue licenses to marry in any parish within the Province of Canterbury. I have located a total of eight licenses, issued from one or the other of these sources, which pertain to people with the Norfleet surname. The information recorded is really from the allegations made prior to actually receiving the licenses. These allegations frequently included such valuable genealogical information as age and occupation. In 1538, Thomas Cromwell, then Vicar-General of England, issued on King Henry VIII's behalf an injunction requiring the parish clergy to commence the keeping of paper registers recording every wedding, christening and burial taking place in their parishes. However, only a few registers go back to this date; it was not until about 1600 that almost all parishes in Kent County were keeping systematic records. In 1597, the Provincial Convocation of Canterbury ordered that the old paper registers should be transcribed onto parchment and the churchwardens of each parish should within a month after Easter transmit to the Diocesan Registry a transcript of the register entries for the prior year. These documents, referred to as Bishop's Transcripts, for parishes in Kent County are currently being maintained at the Canterbury Cathedral Archives. Unfortunately, no records were kept in most of the parishes during the English Civil War and Commonwealth Period (1640-1661). 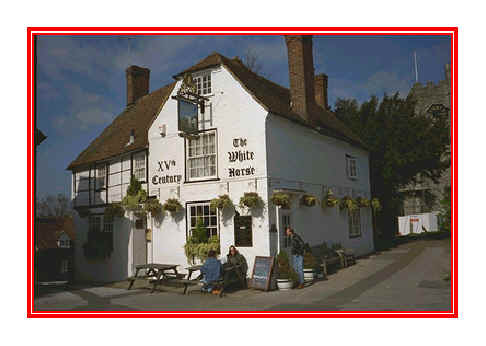 The eight references to the Norfleet family contained in the parish records of Chilham and Molash have been combined. These parishes are physically adjacent to one another. Furthermore, in the seventeenth century, the manor of Molash was subject to the Lords of Chilham Manor (who were members of the Diggs Family, see Section 2 of my essay on the Norfleets of Colonial Virginia and North Carolina) and the Vicar of Chilham was also the Vicar of Molash. I didnt have time to visit nearby Molash, but was told that at the present time (1995) Molash is really nothing more than a crossroads. I consider it highly probable that all of the Norfleets referenced in the parish records of Chilham and Molash were closely related not only to each other but also to the first Norfleet immigrant to Virginia. By far, the greatest number (33) of parish record entries pertaining to the Norfleets in England have been associated with the Parish of Faversham. The Parish of Faversham is also an incorporated town and port; it is of very ancient provenance with a history going back to Roman times. The town is situated just to the north side of the ancient Roman thoroughfare, which, since medieval times, has been called "Watling Street". The town is a corporate member of the Cinque Port of Dover and hence, in the seventeenth century, was subordinate to the Governor of Dover Castle. In the seventeenth century, Faversham enjoyed thriving shipbuilding, gunpowder and oyster industries. Today its principal industries are fruit packaging and the brewing of beer (at the Shepherd Neame Brewery). 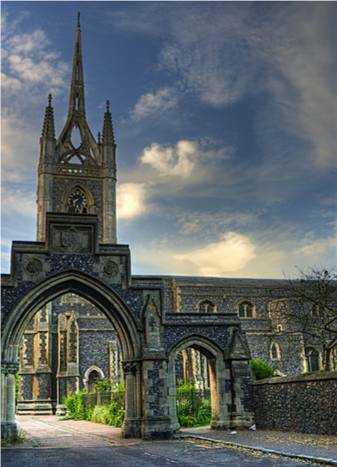 Saint Mary of Charity is the Parish Church of Faversham. (See photograph at the right.) This church is most impressive on account of its surprising size and unusual aisled transepts. Although restored in the late 18th century, it retains many Norman features. The distinctive crown spire dates from 1797 and the elegant nave from a slightly earlier period. Particularly interesting features are the grotesque misericords beneath the choir stalls, the brightly emblazoned tomb of Edward Fagg, and the 14th Century frescoed octagonal pillar. In 1688-1689, John Norfleet (1653-1690) was one of the parish churchwardens here. My personal belief is that the Norfleets of Faversham are almost certainly related not only to the Norfleets of Chilham/Molash, but also to the first Norfleet immigrant to Virginia, Thomas Northfleete. The hearth tax was initiated in the year 1662 and continued until 1688. The tax formed a major part of the governments revenue during the reigns of Charles II and James II; however, it was abolished after the Glorious Revolution deposed James II. Hearth taxes were imposed on the occupiers of houses (rather than owners) at the rate of 2 Shillings per each hearth (chimney). The tax for each year was collected in two (2) installments, the first due at "Lady Day" (L = 25 March) and at the second at "Michaelmas (M = 29 September). The tax was collected at the county level, hence some copies of the returns are available at the county record offices. However, most existing returns are located at the Public Record Office (PRO). 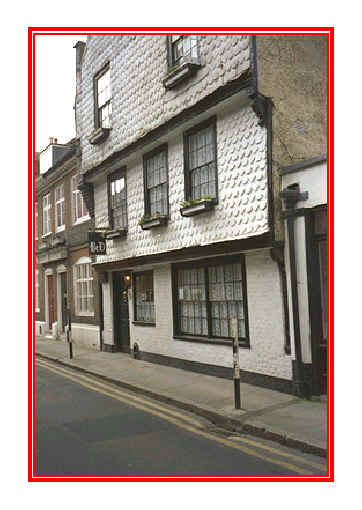 I reviewed the original County Kent tax lists for the years 1662M, 1663L and 1671M at the PRO in Chancery Lane, London; the microfilm of the list for 1664L was also reviewed at the Centre for Kentish Studies, Maidstone. None of these lists are complete for all parishes in Kent, however, the 1671M list is the most complete listing (about 28,000 names) now extant for Kent. The purpose of my review was to find potential new candidates for the household from whence the original immigrant, "Thomas Northfleete" (who apparently had arrived in Virginia Colony in the year 1666) derived. Unfortunately, I could locate no new family groups. The 1664L list disclosed, for Molash parish, the name of "Thomas Northfleet" (2 hearths for one house and 1 hearth for another house). Of course, this Thomas Northfleet, yeoman, is already well known to us from parish register entries and from his will that was probated in the Archdeaconry Court of Canterbury in 1681. In the 1671M list for Molash Parish, the name "Thomas Norfleet" appears, for 2 hearths. This obviously is the same person as found in the 1664L list. Returns for the town of Faversham were missing from the 1662 and 1663 lists, hence I could not check for the presence of John Norfleet, mariner of Faversham, who died in January 1663 and whose will was probated in the Prerogative Court of Canterbury. The 1671 list did include the town of Faversham but no Norfleets were noted. Failure to find any additional Norfleet households in the 1671M list is particularly disappointing as it is the most complete hearth tax list for Kent now extant. The conclusion to be drawn is that Norfleet households are extremely rare during this time frame and no candidate families, from whence the original Virginia immigrant came, are yet discernible. The latest reference to a Norfleet living in England, which I have been able to locate, occurs in the year 1781. It was reported in that year that "Mister William Norfleet" had died at the age of 97, at Henley upon Thames Parish, Middlesex County (a town near London). The notice appeared in Gentleman's Magazine and Historical Chronicle, Volume LII, for the year MDCCLXXXII, Page 599. Normally, this magazine only takes note of people who are members of the English gentry and/or aristocracy. However, I believe the death of William Norfleet was noted, not because he was a member of the gentry, but because of his advanced age at the time of his demise. In general, spelling in the English Language did not become standardized until after the publication of Dr. Samuel Johnson's Dictionary in 1755 and surname spelling did not stabilize until many years later. People in the early days, including learned men, spelled as the spirit moved them, sometimes using two (2) or more different spellings of the same words in a single document. Before the mid-Eighteenth Century, I also have found the spelling of the Norfleet surname to be very inconsistent in both England and Virginia Colony. During the Middle Ages, it was customary to use the Latin/French preposition "de" (from) in front of surnames associated with location, as in Master "John de Northflete" (d. 1335) and Master "Thomas de Northflete" (d. 1317). By the end of the Fourteenth Century the use of the "de" preposition was going out of use; from the time of Robert Northflete (c. 1399) forward, the use of the "de" preposition is no longer found in connection with the Norfleet surname. Many spelling variants were used; in some instances using a "th" as in "Northfleet" and in some instances dropping the "th" as in "Norflete." Sometimes the same name would be spelled in two different ways in the same document; for example, in the Will of Thomas Norfleet (died 1680/1681), Yeoman of Molash, the surname is spelled both as "Norfleete" and "Norfleet." Frequently the surname of the same person would be spelled differently in different documents. For example, John Norfleet (died 1689/1690), Blacksmith of Faversham, is referred to in the Parish Registers as both "Northfleet" and "Northflete," yet he himself signed his name as "Norfleet" on the Bishop's Transcripts which were forwarded under his signature as Churchwarden for the year 1688/1689. The "Norfleet" spelling, of course, is the one most in use in the United States today. However, in earlier times, it was not uncommon for Norfleets of the same family to be referred to by several different spellings of the surname. A preliminary analysis of the first names associated with the Norfleets of England, indicates that "John" and "Thomas" were the names most preferred for Norfleet males throughout the entire period and particularly during the seventeenth century. Both of these names were in common use, along with "William", among the general population throughout the Seventeenth Century, however, not quite to the same degree. Another naming convention, particularly practiced by the Norfleets in seventeenth century Faversham, was the use of the same first name for a child that had already been given to a previous child, born of the same parents, who had died . This naming practice, probably caused by the high rate of child mortality in those days, might continue for several births, until a child was obtained that lived past infancy. Therefore, not only will you find the frequent use of the names "John" and "Thomas" by different Norfleet families, but you will also find the use of these same names several times by the same parents! Very few Colonial Virginia records pertaining to the Norfleets have survived. However, those now extant strongly imply that the first Norfleet to immigrate to Virginia, in about 1666, was named "Thomas" and that he had at least two (2) sons named "John" and "Thomas." Unfortunately, the very frequent use of these same first names among the Norfleets in Seventeenth Century England makes it very difficult to identify the English origin of the first Norfleet in Virginia Colony. There was a very high rate of child mortality among the Norfleets in Faversham Parish, Kent County in the late Seventeenth Century. John and Katherine Norfleet of Faversham (see family group sheet) had seven (7) children, all of whom died prior to reaching the age of eleven (11) years. Furthermore, Thomas and Elizabeth Norfleet of Faversham (see family group sheet) had eight (8) children, of whom all but one child (Ann), died before reaching seven (7) years of age. This is indeed a high rate of mortality, even for the Seventeenth Century! A review of all the entries in the parish register for Faversham indicate a very high death rate for children during the 1680's and 1690's. Diseases, such as smallpox and typhus, probably are the causes of this lamentable condition. Further research in this area is needed to conclusively establish the etiology. Of the people cited on the above listing, only the first Marmaduke Norfleet (1700-1774) lived past his fifties, reaching the ripe old age of 74. At the time, this achievement was considered so remarkable that Marmaduke made note of it in the preamble to his will! 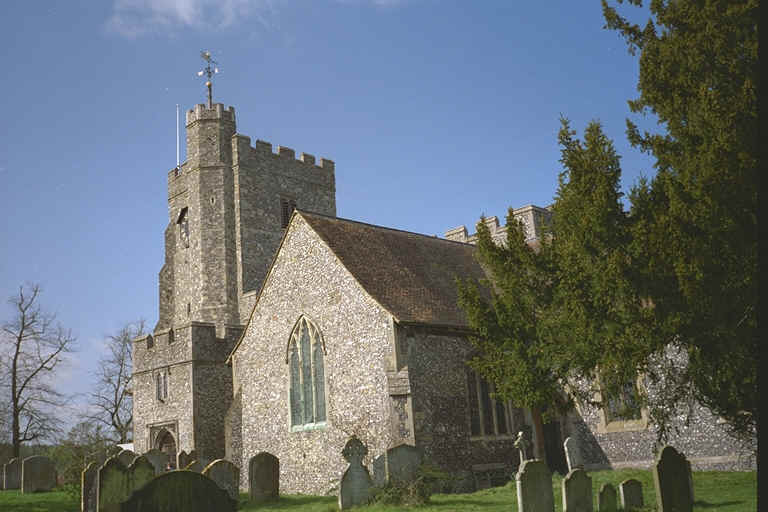 Analysis of all the available records indicates that at least some of the Norfleets of Chilham, Molash and Faversham were related. Thomas Norfleete, yeoman of Molash appears to be son of John Norfleet of Chilham, and also the father of John Norfleet, blacksmith of Faversham. Also, John Norfleete, mariner of Faversham may be the brother of Thomas, yeoman of Molash. This chart shows a possible relationship between these people. 1. David Hey, The Oxford Guide to Family History (1993), page 224. 2. David Hackett Fischer, Albions Seed (1989), pages 308-309.